The City’s Beaches & Parks Maintenance Manager, Keeps it Clean. 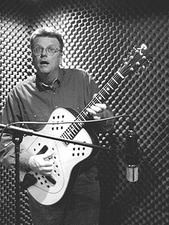 As a singer-songwriter, Dennis has released two solo CD’s, appeared on two CD’s with the new-grassy Andy Rau Band, and on two CD’s with the roots rockers, Blue Mama. He sings and plays acoustic and electric guitar, mandolin and bass, and has done live radio concerts on several Los Angeles stations as well as KSBR in Mission Viejo. Reed will soon be the narrator in an up coming, musical, production, called “Be Careful What You Dream.” In collaboration with other musicians, he has written both lyrics and some dialogue for this play, and contends that his musical avocation is cheaper than psychoanalysis. Born in Pasadena, Reed moved to San Clemente in 1978 from Fullerton where he and his wife were attending college. Prior to his move, he had worked for five years at CBS Musical Instruments in Fullerton, commonly known as Fender Guitar. At Fullerton Dennis started working in the wood shop, then moved to maintenance, and was groundskeeper his last three years there. In college earlier, he had worked for a commercial landscape maintenance firm. Looking for cost savings, CBS had terminated a landscape contract with a three-person crew and “promoted” Reed to head (and only) groundskeeper. Dennis recalled that he was able to convince them of a need for staff, and it became a good training ground for learning more about landscaping. “Government work is in my DNA, a genetic flaw,” Dennis revealed. “My dad was a park host for Riverside County.” Many of Reed’s other relatives also worked in government jobs - fireman, paramedics, public works, among others. Having had friends in San Clemente since the early ‘70s Dennis says, “as an easily swayed young man,” - when a friend had a great apartment in San Clemente and told me he was moving - “we threw caution to the winds and moved without even having jobs.” Strange talk for this energetic, multi-tasker, who has at least three jobs now, plus maintains an active family life with wife, Waverly, a graphic artist, and son, Mark, 12. Although his formal education was in liberal arts, Dennis was schooled mainly through his life experiences, accompanied by several job specific, certificate programs. When he began his City tenure, the population was closer to 24,000, now it’s pushing 66,000, with a projected build-out of 75,000 people. He has a full-time staff of four park inspectors, one full time maintenance worker, and a dozen or so contract-workers. He oversees a basic budget of well over three million, including maintaining over twenty-one parks, with more on the drawing board, 250 acres in all, including green belts, parkways, medians and the City’s beaches from North Beach to T-Street. Working to maintain parks, many of which are 50 to 60-years-old, would be a daunting task for anyone, let alone someone with so few staff members. The new thought process for the City has become “we can’t build it unless the City can maintain it.” The beaches and parks department is in competition with other City entities for the funds to both build and maintain new parks. Dennis is hopeful that there is someplace in between where he can meet the public’s expectations and still co-exist with the City’s goals. As a longtime San Clemente resident and taxpayer, he is also a stakeholder in the City and he cares about the budget and the outcome of his level of service. There are different expectations from different segments of the population. A surfer wants one thing, a family another and seniors, or singles, another. They all have a variety of requirements for their City beaches and parks. But they all share a common desire; a safe, clean, green, environment. When asked what he would like San Clemente Journal Reader’s to know about his hopes and dreams for their city and about his working philosophy, Reed’s already expressive face, crinkles up as he seems to be looking far away recalling a recent experience at his church. A guest speaker asked the congregants to “write your obituary.” Dennis pondered about what he might like to be remembered for. As it turns out, he never thought of himself as a provider of community service - being taught as a southern child not to “blow his own horn,” – but he would like to be remembered for, perhaps in some small way, making his community a better place in which to live. To learn more about Dennis Reed visit www.dennisrogerreed.com. or call the City of San Clemente at 361-8278, where he will be hard at work.